New York-based biotech company Ovid Therapeutics announced on Monday positive phase 2 trial results for its treatment for a rare disease called Angelman Syndrome. Its stock, however, was down 28% following the announcement. 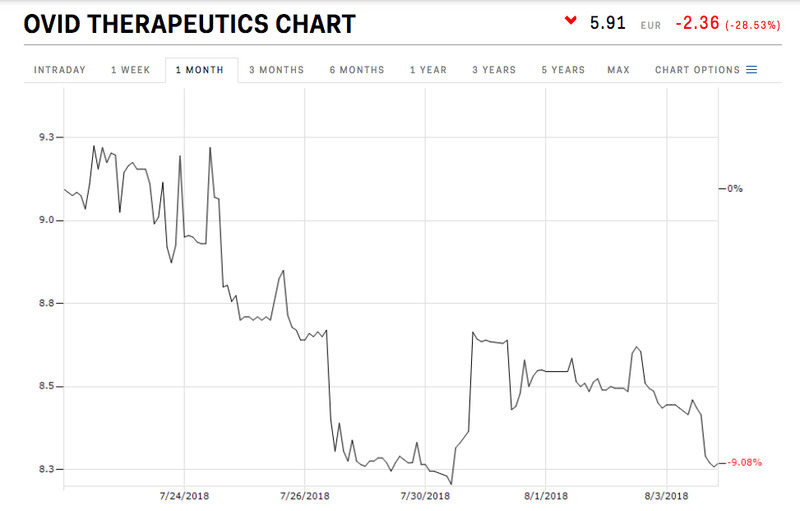 Shares of Ovid Therapeutics fell 28% on Monday, after investors questioned the efficacy of phase 2 data from a new drug used to treat a rare disease called Angelman Syndrome. The drug showed a favourable safety profile and was tolerated in adults and adolescents with the disease, which is a rare and lifelong genetic disorder that affects 1 in 15,000 people in the US. But the stock still fell as some investors wondered if the drug would be more effective than current treatment options which are used to target specific symptoms rather than the Angelman disease itself. Those afflicted by Angelman show severe impairment in behaviour, learning, verbal communication, motor skills, and sleep, and there are no FDA-approved drugs or an established treatment for it yet. The drug, OV101, targets an underlying neurological dysfunction of the disease which results in communication problems between the brain’s neurons. The drug was repurposed from an old drug called gaboxadol that was originally studied as a sleep drug.